With one of the most well documented histories in the family of dogs, the American Staffordshire Terrier is a unique breed. His combined power, grace and agility are coupled with a sleek athletic appearance and affectionate nature, making him a most versatile breed. His intelligence is evidenced through success in the obedience and agility field. 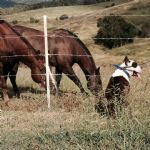 Few other breeds possess such a remarkable combination of gentleness, camaraderie and reliability. 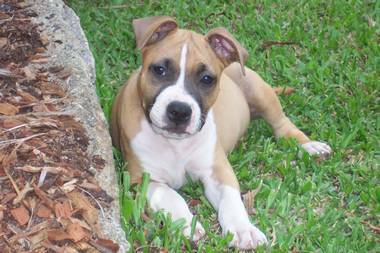 The American Staffordshire Terrier sprung directly from the roots of the Old Pit Dog, as did the American Pit Bull Terrier. However, the two are definitely not the same dog – their origins may relate but that is where the relationship ends. Accepted as a pure breed in 1936, the American Staffordshire Terrier followed a defined breeding pattern which produced a breed so versatile that it is now utilised as a family pet, family dog, guardian, show dog and obedience and agility competitor. It has emerged as one of the most reliable, trustworthy and loyal of all dogs. The American Staffordshire Terrier should give an impression of great strength for his size. Well balanced, muscular yet agile, graceful in movement, is alive to his surroundings, with an excellent sense of smell and hearing. They can be any colour, solid or pied, but all white, more than 80% white, black and tan and liver are not encouraged. Height and weight should be in proportion. Males 46-48 cm (18 to 19in) at shoulder, Females 43-46cm (17 to 18in). The American Staffordshire Terrier is renowned for its reliability as a family dog, they are extremely lovable, loyal and devoted to their owners, with special emphasis on their reliability with children. Notwithstanding this, it must be understood that the American Staffordshire Terrier in most instances will fight when challenged by another dog. The breed requires little grooming as its coat is short, stiff and glossy. Bathing on an “as required” basis will suffice. Owners should ensure their dogs are correctly and adequately housed and not allowed to roam freely in public places. They should be sufficiently controlled in public and not permitted to run near unfamiliar dogs.